As we near closer to the festival date (November 22-23 2013) we are in full planning mode! As we have announced on facebook and twitter we are now offering exciting $1000 award from Awesome Foundation Melbourne. The Foundation provides these grants with no strings attached each month to projects and claims no ownership over the projects it supports. We are so grateful to receive this grant and are pleased to announce that we will be awarded this $1000 grant to one lucky filmmaker at the APERTURE festival! Therefore we have decided to extend the deadline date for submission until August 26th 2013 – postmarked! So, as long as you email your online submission by August 26th and let us know that your DVDs will be arriving, we will still except your submissions! So get on it 🙂 Check out our submission page! 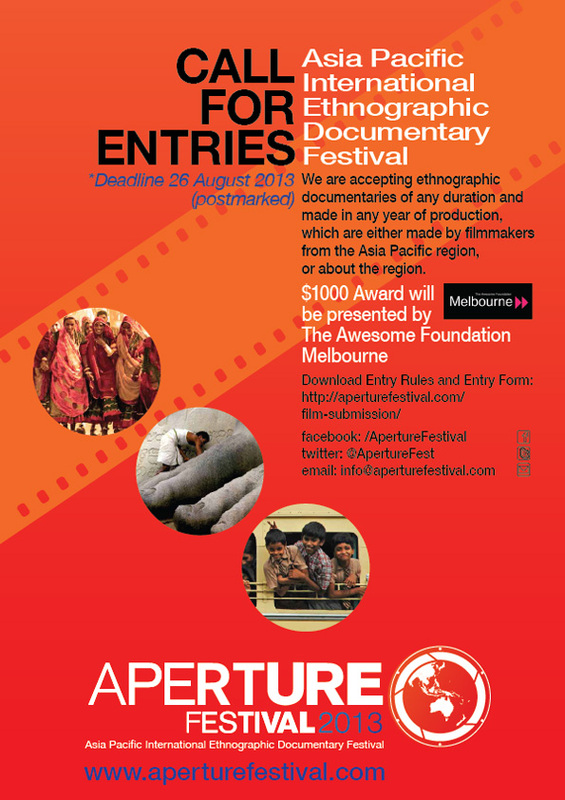 This entry was posted in Blog and tagged #inbetweenmelb, APERTURE Festival, awesome melbourne foundation, call for entries, documentary, Documentary film, ethnography, film festival. Bookmark the permalink.